You’ve heard it time and time and time again: The world of accounting and finance is changing before our eyes. You can blame relentless technological advances, unprecedented regulation and legislation, and demographic shifts that are changing the face of our workforce. At the same time, our clients’ expectations are undergoing some radical transformations of their own. Clients no longer want their accountants to crunch the numbers. They want us to tell the stories behind those numbers and become true advisors who will help take their businesses to the next level. To do that, accounting and finance professionals need a new set of tools. As part of a unique partnership with the Business Learning Institute, Sage has defined those tools in what it calls the Sage 7C Transformation Model. Core beliefs: Establishing your mission, vision, and values will determine how you lead. Outlining your core beliefs will help you decide where you want your firm to go — and where you want it to gain its competitive advantage. Context: Exploring the landscape will hep you better predict your firm’s future. By seeing what’s coming, you get a clear outline of the context of your work. Culture: Defining your behaviors and beliefs will help you decide how you will evolve. Your future journey is defined by the behavior you encourage, teach, and reward. Common language: Our future journey is defined, in large part, by communication. Using a common language will create a strong internal and external identity and brand. Competencies and competence: The skills we’ll need to succeed in the age of artificial intelligence will be different. Being future-ready with your skills will help your firm thrive. Colleagues: Your firm’s success is built on the strength of your people. No matter the sector, well-trained employees are the most important components for gaining a competitive advantage. 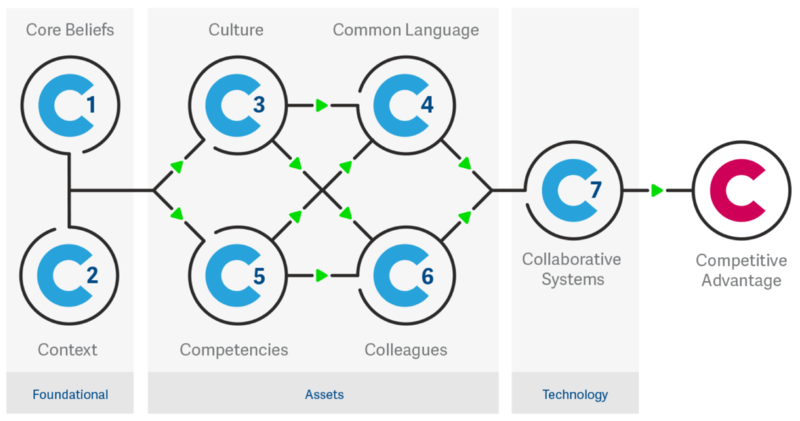 Collaborative systems: The technology you use going forward can be the difference between getting ahead and staying behind. Adapting your business model to your technology — or changing it to adapt to new technology — is vital to streamlining your work. The model was vetted after conversations with more than 50 accountants and thought leaders, with Sage and the Business Learning Institute offering the programs that will teach accountants how to implement these pillars into their organizations. For more information about Sage’s 7C Transformation Model, visit PracticeOfNow.com.